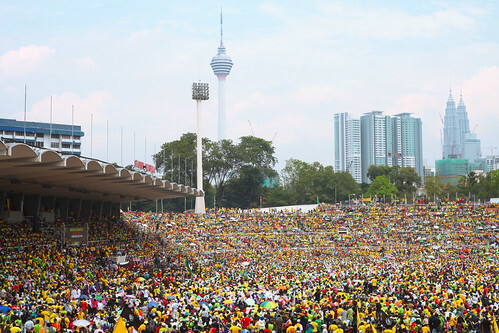 More than 50,000 people have gathered at various spots, all heading towards Stadium Merdeka in the nation’s federal capital to participate in the Himpunan Kebangkitan Rakyat rally (AKA KL #112). Himpunan Kebangkitan Rakyat (literally translates to Uprising of the Citizens Rally) was organised by the Opposition coalition Pakatan Rakyat as they ramp up efforts in the lead up to the yet-to-be-announced general election that must occur sometime in 2013. The organisers have paid US$30,000 to the management as deposit to use the venue and signed an agreement with the police to gather peacefully. The People Power. At 2PM. Syabas & Cheers to The Rakyat. Meanwhile, the Education Ministry has warned teachers and students not to participate in the so-called politically motivated rally. Chief secretary to the government Ali Hamsa also advised civil servants not to be involved in the rally. Parents were told to discourage their children from attending.